"This is a great way to use two of the season's most bountiful crops. 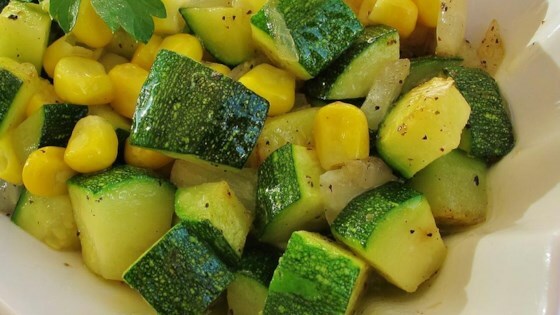 Kernels of corn fresh from the cob and tender zucchini are put to wonderful use in this simple and satisfying summer side dish." Heat butter in a skillet over medium heat, stirring occasionally, until lightly browned, 1 to 2 minutes. Cook and stir onion in the melted butter until translucent, about 5 minutes. Cut kernels from the ears of corn. Add zucchini and corn; cook and stir until zucchini is tender, about 8 minutes. Season with sea salt and pepper. Once could certainly argue that this needs "seasoning," but I would argue this is perfect just as is - I like the fresh, clean, unenhanced flavor of good, fresh vegetables. It was pretty good. I found it a bit bland, so I added a can of Old El Paso chopped green chilies and a bit more seasoning. A classic, simple and tasty side dish. Thoroughly enjoyed the fresh taste of the corn and zucchini. Very nice Sara B. We enjoyed this, very easy to make. This is the best recipe, it is super easy. Since I started making this recipe in winter I used frozen corn, about 2 cups. This recipe is awesome! I make it all the time! Sometimes I use olive oil instead of butter and add red bell pepper for flavor/color. One of my favorite veggie dishes!! !